Las Vegas — March 7, 2017— JLG Industries, Inc., an Oshkosh Corporation company [NYSE:OSK] and a leading global manufacturer of aerial work platforms and telehandlers, today entered a new product category with the launch of its utility vehicles. The company showcased two models—the three-seat 315G and six-seat 615G—at Gold Lot booth #G3946 during CONEXPO 2017. Both the JLG 315G and 615G feature a 10-inch ground clearance with four-wheel drive and an independent suspension to keep all four wheels on the ground during travel, delivering superior traction and balance. While in operation, drivers can shift between two-wheel and four-wheel drive, locking the differential, for improved control. Durability is further enhanced by a rugged axle, standard skid plate, brush guard bumper, heavy-duty steel frame and powder-coated paint. The JLG 315G and 615G boast class-leading cargo capacities. The 1,000-pound cargo box, 1,500-pound towing capacity and removable truck bed panels to accommodate a full size skid, mean operators can carry more material, reducing the number of trips around the worksite. Rental customers gain the added peace of mind that comes with knowing their investment is backed by JLG’s comprehensive parts, service and support network. Standard features on the vehicles include contoured seats and foot beds, individual headrests and seatbelts, power steering, backup alarm, and remote oil and filter check capability. Operators can choose from additional options to enhance comfort. These include an enclosed cab, heater, windshield, and beacon. 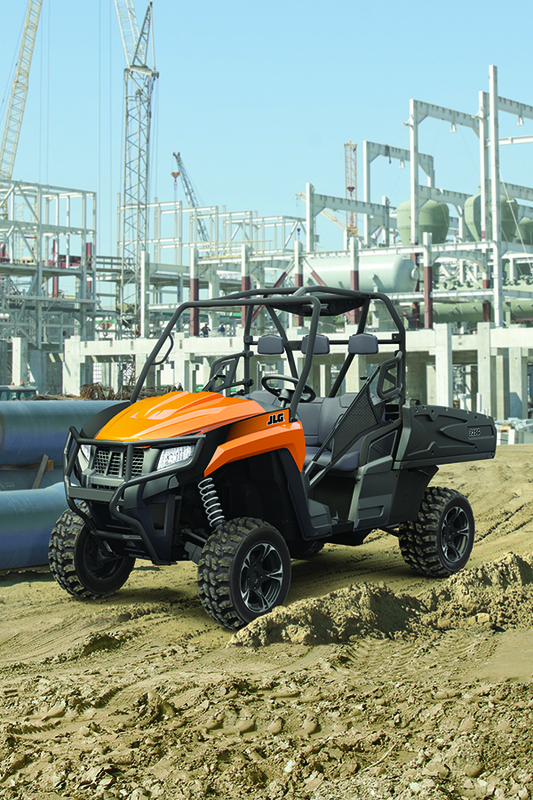 Available in North America, these gas-powered vehicles (diesel models will be introduced later this year) are manufactured through a partnership agreement with Arctic Cat. Their versatility makes them an efficient means of moving people and materials around large construction sites, convention centers, event venues and commercial business parks. For additional information about the JLG 315G and 615G utility vehicles, visit booth #G3946 at CONEXPO or www.jlg.com. For more information on JLG at CONEXPO, visit https://www.jlg.com/en/conexpo-2017. Disclaimer - This product is intended for commercial use only. Oshkosh Corporation is a leading designer, manufacturer and marketer of a broad range of access equipment, commercial, fire & emergency, military and specialty vehicles and vehicle bodies. Oshkosh Corporation manufactures, distributes and services products under the brands of Oshkosh®, JLG®, Pierce®,McNeilus®, Jerr-Dan®, Frontline™, CON-E-CO®, London® and IMT®. Oshkosh products are valued worldwide by rental companies, concrete placement and refuse collection businesses, fire & emergency departments, municipal and airport services and defense forces, where high-quality, superior performance; rugged reliability; and long-term value are paramount. For more information, please visit www.oshkoshcorporation.com.